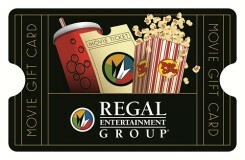 Give the gift of movies with Regal gift cards. They are the perfect gift for every occasion. Regal gift cards are good towards both admission or concession purchases and are redeemable at any Regal Entertainment Group theatre nationwide, including Regal Cinemas, United Artist Theatres and Edwards Theatres. Regal gift cards are not only the best gift in entertainment, but are completely hassle free and have no expiration date or dormancy fees. Regal Entertainment Group operates the largest and most geographically diverse theatre circuit in the world, with over 530 theatres in 37 states and the District of Columbia. Regal CineMedia Corporation is not a sponsor or co-sponsor of this promotion and is not affiliated with this program. Please see back of gift card or visit www.REGmovies.com for terms and conditions of use. Regal Entertainment Group is not liable for any alleged or actual claims related to this offer. ©2010 All rights reserved - Regal Entertainment Group, Inc.